In the run up and throughout MIPJUNIOR and MIPCOM in Cannes next month, Jetpack will be looking to secure further homes for the popular properties that have already proved their worth with kids and parents in the UK. 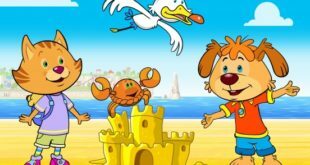 The new block launched yesterday and has picked up all three seasons of Pip Ahoy, airing episodes every week day. The hunt will take place around the seaside towns of Penzance, Padstow, Falmouth, St Ives and Newquay in Cornwall and in Crealy Adventure Park and Resort in Devon.